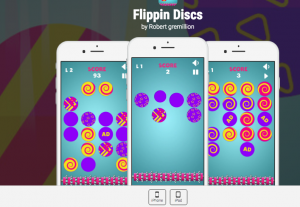 What it is: Describing itself as a “fun and easy-to-play arcade game for adults,” Flippin Disc is a free app that has you clicking on colored discs before they fall into the grinder. What I love: This is a fast-paced, colorful game that has you discerning between discs that say “ad” and all the rest of the discs (which are blank or say words similar to “ad,” such as “dad” or “bad” or “a”). If you accidentally click on a disc that says “ad,” your game will end and you’ll be forced to watch an advertisement before continuing to the next game. There are 30 levels to complete to win the game. Despite the pressure to spot and click on the correct discs in a timely manner, the game is quite relaxing. Although, I assume the higher the level, the more stressful it gets as they speed up the rate at which the discs are falling. What I’d change: The game’s description refers to it as something to work your memory, but I don’t know how that’s accurate, unless there’s some sort of pattern that I haven’t noticed and memorized. Also, the screen color changes but it would be nice if the discs changed colors for each round.